What a wonderful 2018 Sailing Season we had! Thank you to all the participants and staff for making it a huge success! Registration for Summer 2019 has begun! VERY IMPORTANT: When setting up new accounts, the Head of Household is the primary account holder. Please do not add a child's name to the Head of Household field. Add family members after you create the account in your name. We must have your emergency contact information. Thank you! 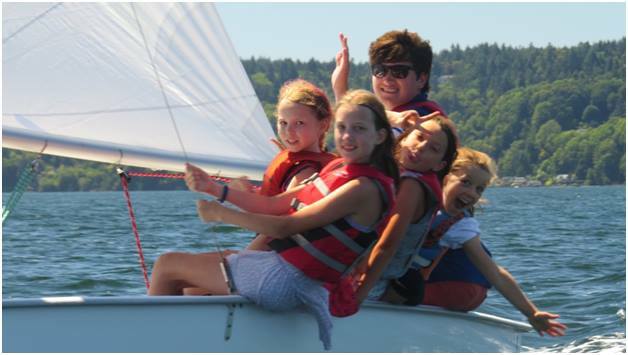 For private adult Sailing lessons please contact Jeff Chale - 206-910-4864. Includes 4 days of lessons (no overnights) Monday through Thursday, for much of the day. You can see each course in detail if you click on the "Info" button next to the course you are interested in. There are two tiers: Beginner for ages 8-12 and Junior for ages 12-18. Experience and previous classes may be taken into consideration instead of age. Our apologies, but we no longer offer a discount for repeat sailors. For reasons of confidentiality and safety, we cannot disclose which class a particular child is attending for those looking to pair their child with a friend. For all questions related to the operation of the Sailing Program, temporary summer employment, boat maintenance or sailing instructor certification, please email Jeff Chale at jwchale@yahoo.com or call 206-910-4864.